I have decided to write about this release by J.Cannon & Z.Zsigo since it made me a little confused. Not because of the music, but because of what I feel about it. I am far from being a fan of any sort of Synth pop band. I think the only album of this genre that I have at home is something I got years ago and put on my shelf without even listening to it, mainly because it had a nice cover art, to be honest. Maybe I am missing some sort of a masterpiece, but I never liked the quasi futuristic, soft and, well, all too nice aspect of this music. Sorry. 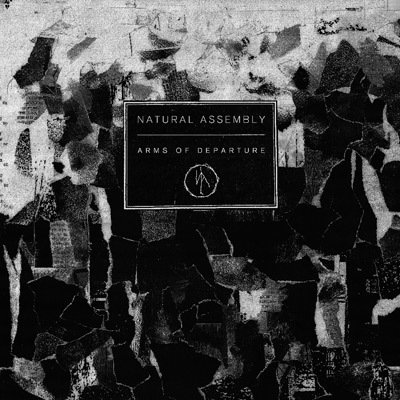 But Natural Assembly comes with something a little different. On “The figures of all compulsion” you can hear the usual elements of this genre, mixed with dirty, almost muddy drops of lofi darkwave and distorted buzzes that makes the music suddenly sound much more attractive to my ears. “Ruination” proves to be an even better encounter, with barely comprehendible vocals that are reverbed beyond recognition and give this track more primitive colors that make it a great closure to this creation. “Nightfall” begins with a distorted wall of noise that yields to robotic, yet tribal sounding drumming on one hand, and melancholic synth music on the other. This sort of combinations and blending makes this album a rather interesting and enjoyable album. After running ‘Arms of Departure’ several times, I am a little tempted to give that synth pop album I own a listen. I think I might just do that.